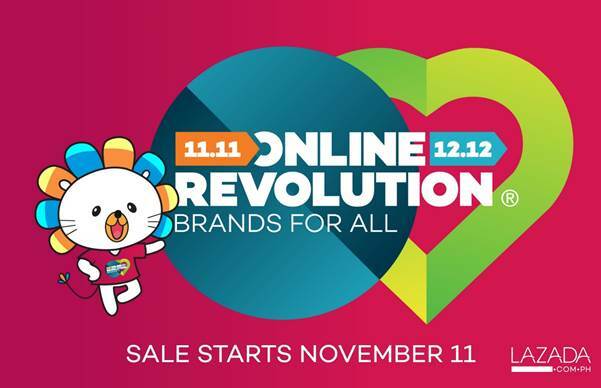 Home Lazada Shopping Lazada launches Online Revolution 11.11 with more than 1M deals! Lazada launches Online Revolution 11.11 with more than 1M deals! The biggest online shopping event in Southeast Asia kicks off on November 11, 2016 with the participation of more than 12,500 local and international brands and 6,000 merchants. This month-long shopping event is Lazada’s fifth Online Revolution since its launch in 2012. This year’s theme is ‘Brands for All’, putting customers’ favorite brands in the spotlight. Customers can expect jaw-dropping, well-curated offers, and exclusive launches of branded items. These deals come on top of the wide and growing assortment on Lazada. To date, Lazada boasts an unmatched catalog of close to 30 million products for consumers across six Southeast Asian countries. In the Philippines, the assortment grew 4 times more than in 2015. Ever tried making a wish whenever you see 11.11 on your watch or clock? No need to be on the constant lookout because Lazada’s Online Revolution is guaranteed to make your Christmas shopping wishes and dreams come true with an awesome plethora of deals and steals. Visit www.lazada.com.ph or download the Lazada mobile app for free to join the biggest online shopping event of the year. Sale runs from November 11 to December 12, 2016.